Dental implants are by far one of the most successful dental operations. That’s also why they’re so popular. Dental implants could be said to be a crowning achievement of the dental profession. All puns aside, with a 95%-98% success rate, you’ll hardly ever find a more effective and aesthetically-pleasing option for replacing your missing tooth. Penn Dental Medicine offers affordable dental implants at very competitive rates. Many of our patients choose us for our high quality of care and state-of-the-art technology, in addition to our teaching clinic prices. 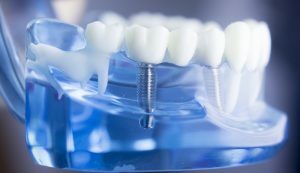 An implant includes the root of an artificial tooth made of titanium metal. It fuses to your jawbone to become the root for your missing tooth, where your dentist will place a crown, denture, or bridge. This operation is low-risk and long-lasting, which is why many patients opt for it. The alternatives simply aren´t a match for a dental implant when it comes to permanence and effectiveness. One option is a tooth-supported bridge, which is less stable than an implant. Another option is partial dentures, which don’t look as good as nor function as well as an implant (many patients using dentures report having difficulty eating or talking). And while a resin-bonded bridge works better than dentures, it doesn’t function as well or last nearly as long as an implant. As mentioned before, dental implants boast an extremely high success rate between 95 and 98%. When a dental specialist performs the operation, the success rate is even higher. A dental implant looks exactly like a real tooth. Not only that, but it fits in with all your teeth in such a way that it even feels like a normal tooth. Because it’s fused to the bone, it has no problem keeping up with the teeth around it! Worried about the fuss of eating? You don’t need to be with dental implants. An implant gives you a normal chewing experience. You can bite just like you would if it was a real tooth. No denture-sliding or awkward food movements in your mouth! We offer affordable dental implants payment plans so that the solution is feasible for you. Because we really believe that dental implants are the best option, we go the extra mile to make sure that it works with your budget. At Penn Dental Medicine, the price of several implants or even full mouth dental implants is highly discounted down from the market price. As a dental school, we can afford to do this because our primary mission is educational. When you consult with your Penn dentist, you’ll receive a treatment plan outlining the recommended treatment, how much it will cost, and what is involved. If you think you’re due for a dental implant, and you’d like to learn more about what we can offer, please give us a call at 215-898-8965. Also, be sure to use our 25$ off coupon on your first visit!